Stretched side panel replacement is one of our staple offerings; typically, we handle around 200 stretched side panel replacements in a year. We are rightly proud of our skills and results in this area: indeed, when one of our manufacturers recently visited us, they commented that they are unable to fit their panels as tightly as we do! Stretched panels need to be tight so that they do not ripple or distort in the sun; this is a real skill in itself – not many in the industry are able to do this properly! Our ability to fabricate and fit panels to such a high standard means that we get work from all over the country. So impressed with our service are our customers that they send vehicles from as far away as Scotland for this service. We work on any size of bus and coach and have the facilities and skills to replace the panels on double-deck coaches, a service that relatively few in the industry seemingly offer. 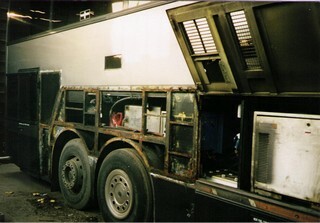 For more details on our stretched side panel replacement and bus repair services, please call us on 01922 495522.